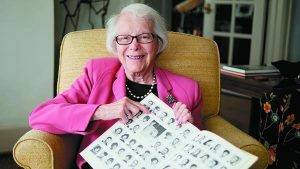 When Kathleen Straus retired in December at the end of her three eight-year terms on the Michigan Board of Education, she was one of the longest-serving board members and well-respected for her indomitable commitment to public education. Her colleagues recognized her expertise and leadership by electing her board president six times. Straus’ work for both government and nonprofits spans the eras from school busing and desegregation to today’s focus on charter schools and protection of LGBT (lesbian, gay, bisexual and transgender) students. Beginning as a classroom teacher and later PTA president, through both volunteer and professional positions, she perfected the skills necessary to get people to work together. Detroit Women’s Forum 49th Anniversary gathering at Whitney in Detroit, Dec. 12, 2014. Kathleen Straus, center, with Gene and Elaine Driker. On the heels of Betsy DeVos’ confirmation by the U.S. Senate as Secretary of Education, Straus, who opposed her nomination, is concerned about the potential expansion of charter schools. “She and her husband supported lifting the cap on the number of charter schools authorized by universities, which has been very destructive in Michigan,” Straus says. “Eighty percent of the charters in Michigan are run by for-profit companies — much higher than other parts of the country. Only a handful are better than the regular public schools that have the majority of special education students, who are the most expensive to educate. There are about 100 charters in Detroit and 97 real public schools,” she says. In addition, Straus is worried about DeVos’ record as a strong supporter of school vouchers, which would allow parents to use a set amount of state funds per child to purchase education in a public (charter or traditional), parochial or private school. Straus points out that good private schools cost more than the amount provided by vouchers; she views them as a violation of church and state — a separation stipulated in the federal Constitution. Michigan voters have rejected school vouchers three times, she says, voting against them with strong majorities in 1970, 1978 and 2000. The use of public funds for parochial and private education is prohibited by the Michigan Constitution and vouchers have been defeated in other states as well, Straus points out. Straus is familiar with public education as a student, parent and teacher. She was born in New York and graduated from Hunter College, one of the oldest public institutions in the country, with a major in economics. Initially, she followed a common path for young women of that era — teaching (in the South Bronx) while living with her parents. But she decided to pursue an interest in government and soon took a job at the Treasury Department in Washington, D.C. After her marriage to Everett Straus, an economist who accepted a position at the Detroit Cigar Company, they moved to Detroit. Like many other young Jewish couples during the 1950s and ’60s, they lived in Northwest Detroit. Straus became president of the PTA at Schulze Elementary School, where her two children attended school, and active in the city-wide PTA. She joined the Detroit chapter of the League of Women Voters, becoming its president and later serving on its state board. Straus said the League was then an “outlet for women,” but also a force for better government. The League thought the state constitution needed updating, she says, and Straus participated in the Michigan Constitutional Convention that altered the document in major ways. During the 1950s, she volunteered for several millage campaigns to support the Detroit Public Schools. In 1967, her husband died suddenly on Thanksgiving. Straus needed to work and began a career in government and civic affairs. She served as assistant director of the Community Renewal Commission during Detroit Mayor Jerome Cavanagh’s administration and co-chaired his re-election campaign. After his second term ended, she worked at Southeastern Michigan Council of Governments (SEMCOG). However, she continued to be an active voice for public education as a member of the education committee of New Detroit Inc., an influential urban coalition, and was named to a special task force on school finance, chaired by civic leaders. During the 1970s, a controversial Detroit school desegregation case was decided with a U.S. District Court ruling that students would be bused to schools outside their neighborhoods to achieve desegregation. Other cities experienced violence after similar court orders, and local leaders feared the same in Detroit. The business community and UAW joined together to fund and organize a coalition for safe schools — PRO Detroit. Straus was chosen to lead government agencies, school officials, parents, unions and community organizations to prevent violence, and “it worked,” she says. Subsequently, Straus became director of government relations for the Michigan Association of School Boards, lobbying the state legislature on education issues. “There was only one other woman lobbyist in Lansing, but the men were polite and responsive,” she recalls. “I was a woman and small — they felt very protective of me.” It was a time when most of those attending state meetings were male and white, and Democrats and Republicans talked to each other, Straus adds. 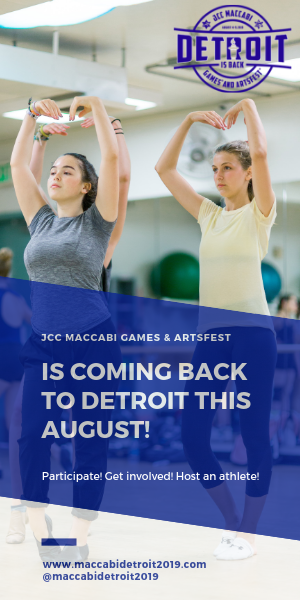 In 1986, she was named interim president of the Center for Creative Studies (now the College of Creative Studies) in Detroit and, a year later, was appointed president. Straus was charged with integrating art and music departments, which were very separate, and she accomplished this. In 1992, she was encouraged to run for the Michigan Board of Education by educators and others. The board is charged with providing leadership and supervision over all public education in the state, including higher education, although it lacks political clout, she says. Charter authorizers (entities that establish and are responsible for charter schools) were supposed to be local people who sought to experiment with educational approaches. Instead, Straus says, for-profit charter management companies were created that sold themselves to the authorizers. As a board member, Straus advocated strongly for a comprehensive high school curriculum that included more than reading, mathematics and science. 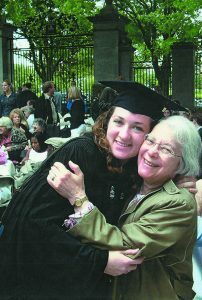 Barbara Kratchman of Bloomfield Hills was president of Art/Serve Michigan, which supported a high school graduation requirement of at least one semester of arts education. “Kathie took up the banner and led the board’s efforts to require arts education in the curriculum,” she says. Straus also advocated for full-day/full-service schools to be community hubs in some neighborhoods, offering tutoring, extra-curricular activities such as music, art and sports, as well as health and social services after the regular school day ended. 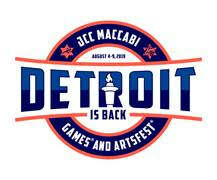 Several such full-day programs were created in Kalamazoo, Grand Rapids and Detroit with positive results. Recently, some local school districts sought guidance from the state board regarding school bathrooms and LGBT students. The board developed a policy based on “equal protection under the law,” Straus says. Although controversial, the policy passed. Straus is very concerned about charter school expansion, especially with the confirmation of DeVos. 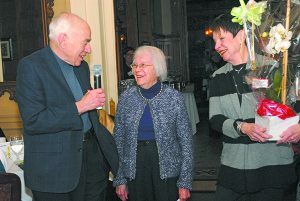 Retirement celebrations for Straus were held in Lansing and Michigan in December. Soon afterward, Straus and her second husband, Walter Shapiro, who recently retired as a federal bankruptcy judge, traveled west to visit family members. Her daughter, Barbara Straus, is a social worker who lives in Lincoln, Neb., and her son, Peter, is a state university professor who lives in Cisco, Calif. Straus proudly shows photos of two beautiful great-grandchildren who were born last year. She and Walter each have four grandchildren. Even without official responsibilities, Straus, who lives in a condominium on Detroit’s riverfront, remains committed to public education. On a cold January night, she attended the first meeting of the newly elected board for the Detroit Public Schools Community District and was encouraged by the proceedings. Straus considers her greatest achievement to be her “consistent support for public education — real public schools, fighting for social justice and for civil rights and human rights. 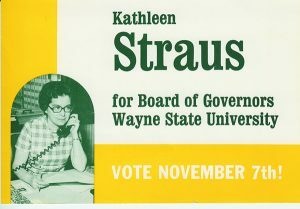 A needs-based scholarship has been established in honor of Kathleen Straus at Wayne State University. To donate, visit https://cardinal.wayne.edu/wsugiving/give.cfm or call (888) 978-4483.